For years, scientists have known that Gliese 710 will come excruciatingly close to our Solar System in about a million years. An updated analysis suggests this star will come considerably closer than we thought, during which time it’s expected to spawn dangerous cometary swarms. Gliese 710 is currently 64 light-years from Earth, but for all intents and purposes, it’s heading straight for us. 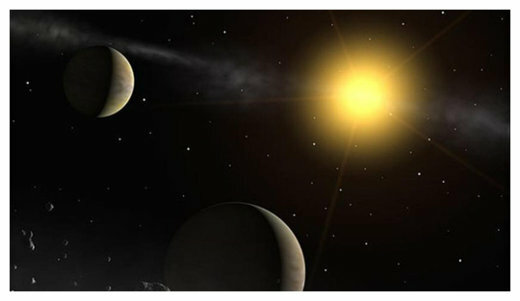 A new study published in the journal Astronomy and Physics projects the close encounter will happen about 1.35 million years from now, and that the star will come within 13,365 AU of our sun (where 1 AU is equal to the average distance of the Earth to the sun), or 1.2 trillion miles. At that distance, it would take light 77 days to reach the Earth. That’s obviously far, but not in cosmological terms. That distance is well within the Solar System’s Oort Cloud—a large bubble of ice and rock that surrounds the sun to a distance as far as 50,000 to 200,000 AU. So while Gliese 710 is sure to avoid a direct hit with any object in the inner Solar System, it’ll likely travel through the Oort Cloud. And with its tremendous gravitational influence (it’s about 60 percent the size of our sun), it’ll perturb the many large rocks currently sitting idle way out there in the outer reaches. This star is poised to send a shower of comets into the inner Solar System, possibly causing a serious impact event with Earth. 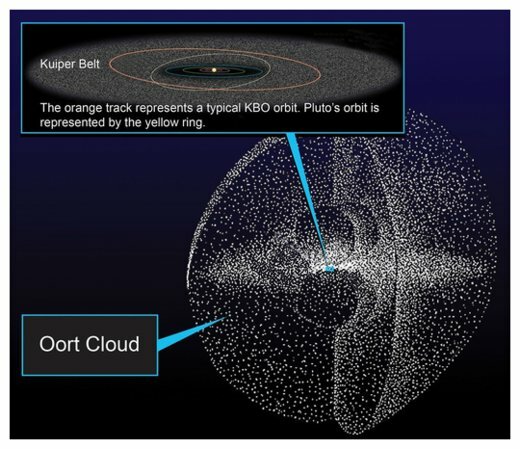 Visual representation of the Oort Cloud, which is littered with ice and rocks left over from the formation of the Solar System. For the study, astronomers Filip Berski and Piotr Dybczński from Adam Mickiewicz University in Poland used data collected by the Gaia space observatory. The new calculations show that the minimum distance of the star will be almost five times closer than previous estimates. At that distance, the star will appear as the brightest and fastest object in the night sky. During its passage, Gliese 710 will spawn observable comet swarms, and about ten new long-period comets each year—and for a period lasting a whopping three to four million years. This star’s influence will be felt on our Solar System for a long, long time. “[This] event [will be] the strongest disrupting encounter in the future and history of the solar system,” conclude the authors in their study. This is obviously bad news for future civilizations on Earth, but our descendants will hopefully have figured out a way to deflect asteroids and comets by then. As an important aside, Gliese 710 isn’t the only star that’s scheduled to make a visit. As many as 14 nearby stars could come within three light-years over the next few million years, two of which are likely to traverse through the Oort Cloud.